With dingoes being absent from ecosystems we have more cats, we have more foxes, we have too many kangaroos, we often have feral goats, pigs et cetera, and they all have their own impacts. 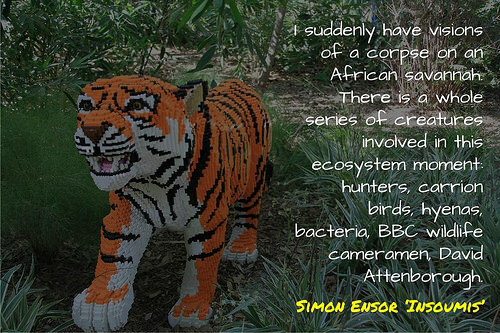 In addition to this, the fence – stretching over 5000 kilometres – costs roughly 10 million dollars a year to maintain. The answer being purposed to improve the state of things is rewilding. Already used in Europe and America, the practise involves reintroducing top-level predators into an ecosystem in order to restore function back to the landscape. One of major concerns comes from farmers who such things as the dingo fence were created for. There have been different strategies and solutions used to quell the impact of predators on livestock. They include: large guardian dogs, such as maremmas, smaller fencing to protect young calves and lamb, as well as reimbursement for lost stock. What is interesting is that it been argued that due to the decrease in herbivores and increase in vegetation, properties with dingoes are actually better off in a net sense. Scientists are therefore proposing not to simply remove the whole fence, but to move parts of it in order to monitor and manage the change. The problem is that at some point, like with all obstacles or walls that we create, the danger we are trying to keep out finds a way in. Maybe then what is needed is a rewilding of education. So often structures are put in place to support instruction and schooling. A point Greg Miller touches on in a recent post. Practises that are then measured and maintained through standardised tests. The learning landscape is then left barron with little beauty and a lot less care. What if we removed the fences, where instead of focusing on managing experiences for students from the top on down, we co-create experiences with students from the bottom up. Supporting students to be what Ewan McIntosh describes as problem finders. This does not mean simply leaving students to their own accord, instead like the guard dogs protecting the flock, support them in the maintenance of their learning portfolios to add discipline to the process. For those learners in need of smaller fences, provide scaffolding in regards to the development of core literacy and numeracy skills, especially in early years. While provide focused assistance to those who need additional guidance to aide their learning. Some see all of this as a risk of sending the lamb to the slaughter. Condemning students to an education of ‘stuff‘. The problem is that we are doing that now. With the research done, it is often already decided what is important to know and do, rather than placing students in the driving seat of their learning. Don’t we need to think about how to re-evaluate 100% of time in order to make school more student-centered, not simply fiddle with a fraction of it? This is not to say that this is simple or without risk. Just as the proposal with the dingo fence is to move a small part of it and then reassess, one approach to rewilding education maybe to take small incremental steps. Set a goal, take action and then reassess. Starting with 10%, as Will Richardson has suggested. A useful strategy in support of such change is the IOI Process which provides a series of tools that helps discuss not only where you are at, but a map of where the next step may lie. Maybe you don’t think that this metaphor works? The strategies are too simple or lack nuance? You don’t think that learning is the top predator? That could be so. However, what is important is to continually reimagine and ask the question, what if? Such ideas may not be right or necessarily work, but they promote more discussions and help build towards a brighter tomorrow. School doesn’t have to involve students sitting in straight lines listening to an all-knowing teacher. Because learning certainly doesn’t involve that. My wife and I sat and watched Argo the other day. We had both read the hype and were dully rewarded, on the edge of the couch to the very end. The question that it left me with though was how many other such stories exist through history of extreme risk that have failed and why are they not the stories that we are told? Having completed my rudimentary study of Joseph Campbell and The Hero with a Thousand Faces, I understand that there is a predetermined nature in all of us that wishes to succeed, a staple of the Hollywood film industry. However, how does this match up with the notion of failure? A part of me thinks that even a hero fails somewhere along the way, often this is making of their success. With all that said, the big problem with failure is that there is still a large majority out there who treat it negatively and are unable to embrace its potential for a greater good. 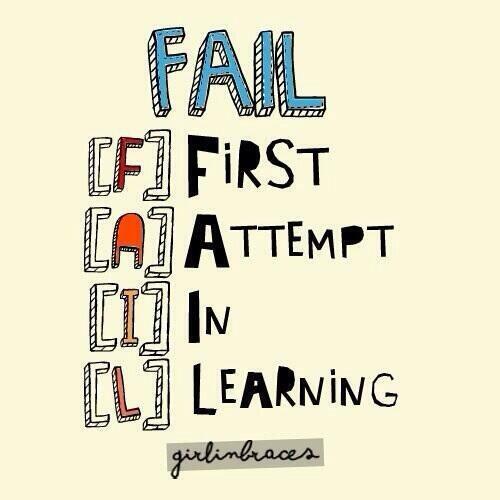 The first place that this needs to change is finding support and cultural role models who say its ok to fail. In a Ted Talk ‘The Clues to a Great Story‘, Pixar’s Andrew Stanton spoke about the need for stronger role models for women in film. Stanton suggested that Brave is one such film where the writers set out to reposition the female character in the role of stronger and more confident hero. Where are such role models encouraging people to take calculated risks in life and fail every now and then? Some of the films that I’d associate with the idea of failure include The Pursuit of Happyness, The Blind Side and Freedom Writers. Each of these films provides a range of situations where people have persevered through their failures in order to succeed in the end. The problem though with these examples is that they either seem too extreme or involve too much chance. Where are the examples and role models for the common people, those individuals whose life isn’t about changing the world of the down and out or playing elite sport. I am not saying that they are not important, but they are not everything. I’m subsequently left thinking of the characters like Walter White in Breaking Bad. Yet not only is Walter anything but a role model, but his life seems to be a is a story of unrecognised successes, rather than clear failures. The more I think about it, there just aren’t the models out there. So in conclusion, I return to the place where I started, would Tony Mendez, the protagonist from Argo, be treated the same way at the end if he came back without the six Americans or would he have lost his job? Would his wife have taken him back? Would he have succeeded in life? I apologise if you have not seen Argo and I have given away too much. Godin’s discussion of being wrong got me thinking. What does it mean to be ‘right’ and ‘wrong’? And how does this fit with education? Does it actually achieve anything to constantly come back to idea of their being a correct answer? It is not that I disagree with Godin’s reflection, but I feel that notions of right or wrong are often left for historians reflecting on the past and even that is questionable. The terms almost feel empty and slightly trivial at times. A spoil often left to the victor. What is achieved in being right or wrong? Often being wrong does not change a thing as it is only after the moment has past that we realise this. At its heart, it is not very useful when discussing lifelong learning. At the very least, it carries with it a negative connotation. What is important, is the way you respond to being ‘wrong’. What aspects that you would change for the future. In some ways the challenge is to be wrong all the time for what do we really learn in being right? 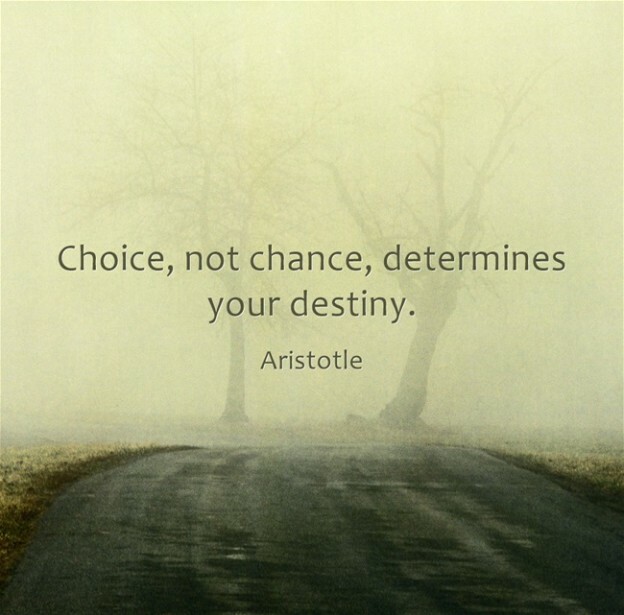 I feel that a better solution to supporting lifelong learning is to focus on choice and consequence, considering how we respond to each situation. This includes unpacking how you came to your particular choice, were there any other options and why did your choice work for your situation? One of the difficulties with being right and wrong is that it is often past tense. Being conscious of some of the choices we make every day allows for reflection in the present tense. Search Engines: In a recent Guardian Tech Weekly podcast, Bing’s director of search, Dave Coplin, put forward the argument that we only use Google, because it is habit and that Bing offers a better experience. Technology: With the rise of BYOD, the question that often gets asked by students is which device should they buy? I recently had a discussion with some of my senior students who are moving into a BYOD environment next year. Their quandary was which device would be the most ideal for learning. In the end, the discussion came down to a question of taste, personal preferences and what particular students wanted to achieve. Voting: A cornerstone to democracy is the ability to vote for the person and party who we think would best represent us. Often people get lost in arguments about who is right or wrong, when all we ever get is a difference on opinions and even that is questionable at times. Being Connected: There has been a lot of conjecture as a part of Connected Educator Month about whether we need to be connected or not. +George Couros suggested that being isolated or sharing with the world is a choice that only we can make. Cloud Storage: You just need to put ‘Google Drive’ and ‘Dropbox’ into any search engine for a long list of discussions about which application is better. However, in the end, each application is different and like the discussions about ‘Bing’ and ‘Google’, often comes down to who you wish to use it. Appropriation of Knowledge and Content: Associated with sharing and being connected, is the challenge to properly acknowledge content. +Tony Richards explored this notion in his blog where he focused on the issues with republishing without recognising where things originate. I could keep on going on and on. However, I think that these examples demonstrate how we can easily get caught up in arguments about what is right and wrong, supposed ‘best practices’, when in fact they are simply choices made by groups and individuals based on what works best for their particular situation. Although we often may have opinions about these matters, such as Google Drive is better than Dropbox as it allows for collaboration. In the end though, that is all they are, neither right nor wrong, just opinions, opinions with associated consequences. Choice comes down to one key ingredient, what works best in a particular situation. Often within this process we are faced with options. I often remind my students that they are in fact free to choose whether to work or not, they even have a choice about whether to be in class. However, what they need to realise is that there are consequences if they do not do their work or if they leave the class, consequences that they need to be willing to accept, because they are their consequences and theirs alone. The biggest challenge is being aware that there is a choice in the first place and accepting the associated consequences attached with such decisions. In approaching things from a perspective of choice I feel that we are more open and able to learn and be inspired by others. In recognising why we chose what we chose, it often means that we have considered what we did not choose and why. Sometimes this consideration means that in a future situation we may make a different choice. There are times when being right and wrong gets us locked into a particular position, a position that many around us refuse to release us from. For example, I once used Dropbox as my primary point of sharing. However, I moved over to Google Drive, as I felt that it offered an easier method of sharing and collaborating. It would be stupid to look back on this situation and say I was ‘wrong’, because at the time I may have been ‘right’. Not only does this point out the historical nature of choices, but it also fails to recognise how and why we change. Being open to choice often means that we are more willing to moulding and adapting our ideas, rather than going through a constant state of revolution, where we throw out the old in order to replace with the new. If we approach everything from being right and wrong, we risk living in an echo chamber. Being open to choice is being open to different voices, to different ideas, to new dialogues and new beginnings. +David Truss spoke about the power of PLN’s in a recent blog. He suggested that instead of simply echoing our own thoughts and ideas, being connected offers us a way of breaking out of the echo chamber, finding out new ideas and points of change. One of the things that needs to be noted with any discussion of choice is that there is a hidden element in all of this. For there are some people in the world who do not have the opportunity to make choices, such as which search engine to use or who to vote for. This maybe the only thing that can be considered as being ‘wrong’ in all of this discussion. Often economics is described as the study of choice. Maybe pertinent approach to economics would be better considered as study of those who don’t have a choice at all. The Victorian government seemingly stepped up their efforts this week to move a step closer ‘performance pay’ this week. Principals across the state have been briefed by the government about a series of changes to current system. The government have been arguing that if you look at overall student results that they form a bell curve with roughly 30% not making the grade. The belief then is that, even though it is often impossible to ‘measure’ effectiveness and success, that the same distribution can be applied to teachers, with the suggestion that, just like students, 30% of teachers are not performing at the adequate standard and should therefore not be simply moved up to the next increment. There are two aspects that stand out to me in this statement. Firstly, the reference to ‘good public administration’, and secondly the use of the word ‘rigour’. The notion of ‘good public administration’ puts down the current administration, implying that things are being done poorly. While the word rigour, suggests that the processes in place could or should be more thorough. What concerns me most about both of these ideas is what the government is doing to support administrators and teachers? Maybe I don’t really know, but it would seem that the since coming to power, the Liberal government has frozen funding, collapsed the number of regions and basically gotten rid of much of the support that was previously available to schools. Much of this is done with some sort of effort to provide schools with more autonomy. It makes me wonder though whether this is what is meant be ‘good public administration’ and ‘rigour’. Many of the changes that have been made feel like an effort to apply more scrutiny and pressure on individual schools, rather than actually provide thorough support. What disappoints me the most is that I do not necessarily disagree that the whole performance and development process could not in fact be improved. However, don’t you endeavour to put in place a better structure first, before making the threats? For example, AITSL provide some really good support for teachers. They are progressively making the process more explicit with the use of various videos and resources, but how many teachers know this or a shown this? Time and assistance is still required to help move towards this supposed ‘rigour’. In the end, surely the government should be encouraging staff to see themselves as life-long learners, I just don’t see how they are doing this? Scratching an itch. Often while reading, there are things that stick out, that prop the ears, the spike the imagination, that remain like an itch. A blog is a way of responding to these things, somehow alleviating the irritation. Being connected. I love being connected, following various threads of thought, commenting, tweeting and reaching out to others, but sometimes a responding needs to be something more substantial. A blog is one avenue that allows this. Life long learning. What I love most about writing a blog is that it allows a space to follow through on different points of learning, a kind of thought experiment, a place to grow ideas, in order that I may develop further. 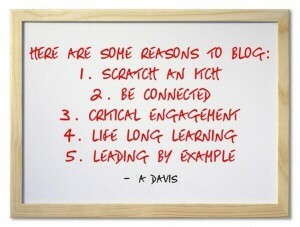 At its heart, a blog allows for the cultivation of seeds of inquiry, exploring and discovering what they may produce. Lead by example. J. Hillis Miller once posed the question: “How can we teach reading if we are not readers ourselves?” I think the same argument can be applied to tools for working in the 21st century. I do not think that ‘teachers’ have to be in control, but they do need to be the ‘lead learner’ as Joe Mazza would put it. To me, that means getting involved from the inside – testing, trialling, questioning, understanding – not just commenting from the outside, and especially not just when you are forced to. 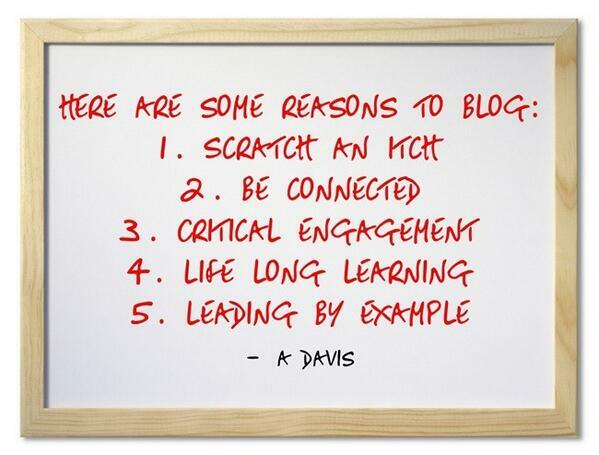 Here are some of the reasons why I choose to blog. Although I am sure there are more, it is at least a start. So what are the different reasons you blog?